I love a good pair of espadrilles. They are the perfect shoes for almost every outfit. 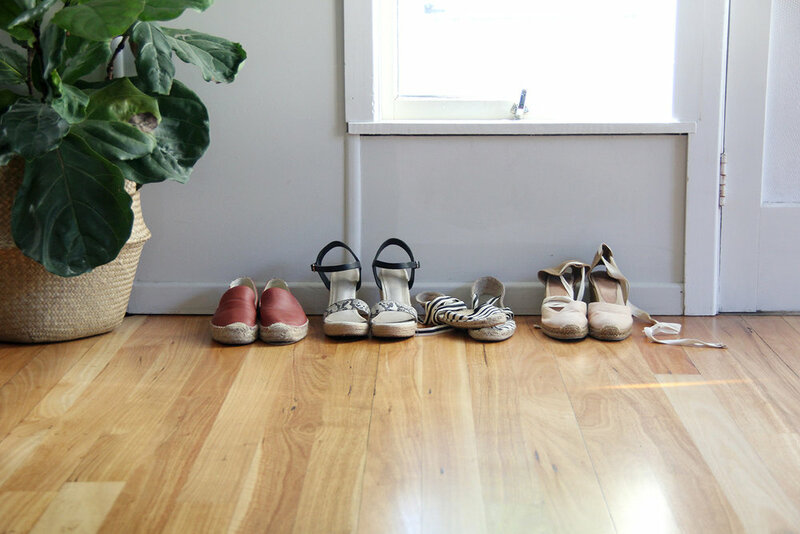 There are so many adaptions of the espadrille – I actually own four very different pairs! When you think classic espadrille I think French Riviera, breezy summer clothes and Jeanne Damas. The classic espadrille is exactly that – classic. Ranging in colour and height, the classic espadrille has a covered toe, some sort of heel, and ties that wrap around your ankle. This type of espadrille looks amazing with any dress or skirt in a floaty or linen fabric. They also give the perfect cool girl vibe when paired with vintage denim and a tee. Similar pair here. The flat espadrille is a more modern take on the original, which I love to pair with pants. It looks especially chic with a pair of cropped pants and a crisp white tee or button down shirt. This is not the technical name for this shoe - I'm not sure what is - but this shoe is a hybrid style. It's a cross between a smoking slipper (my favourite style of flats) and espadrilles. This style is especially cool because it incorporates a ‘flatform’ base, giving you a little extra height and a slightly different look. These are the perfect shoe to wear with skinny jeans. Get them here. Another hybrid style, the wedge espadrille is usually fairly high and strappy but still incorporates the rope weave along the base. These shoes are a favourite for elevating a casual everyday look into something a bit more special for the evening. They’re also great at making a dressier outfit a little more casual. Similar pair here. I love the snakeskin pattern as I feel it goes with everything. I particularly like the juxtaposition of the snakeskin print against a feminine floral dress. Do you like espadrilles? Is it a shoe style you’d be keen to try?